The Arlington County Board is wasting no time in exercising its newfound ability to push for a new name for the portion of Jefferson Davis Highway (Route 1) within county limits. Virginia Attorney General Mark Herring issued an opinion last month that gives Arlington the ability to request the change from the Commonwealth Transportation Board, rather than relying on the state legislature to make the change — something that was unlikely to happen with Republicans in power. The County Board is scheduled to vote next week — at its Thursday, April 25 meeting — on whether to adopt a resolution requesting Jefferson Davis Highway be renamed “Richmond Highway” in Arlington, following the lead of Alexandria which last year also voted for the Richmond Highway name. According to a county preview of the upcoming Board meeting, below, Arlington is requesting that the name change take effect on October 1 of this year. The Board will hold a public hearing and consider adopting a resolution asking that the Commonwealth Transportation Board change the name of the portion of Jefferson Davis Highway that lies within the boundaries of Arlington to “Richmond Highway.” The Board’s consideration of a proposed resolution follows neighboring Alexandria voting in 2018 to rename its portion of the state-owned Jefferson Davis Highway “Richmond Highway,” and the Attorney General’s March 22, 2019 advisory opinion that the Commonwealth Transportation Board has the legal authority to change the name of the portion of the highway that runs through Arlington, provided the Board passes a resolution requesting the change. The resolution, if adopted, would ask that the name change, if approved, would take effect Oct. 1, 2019. 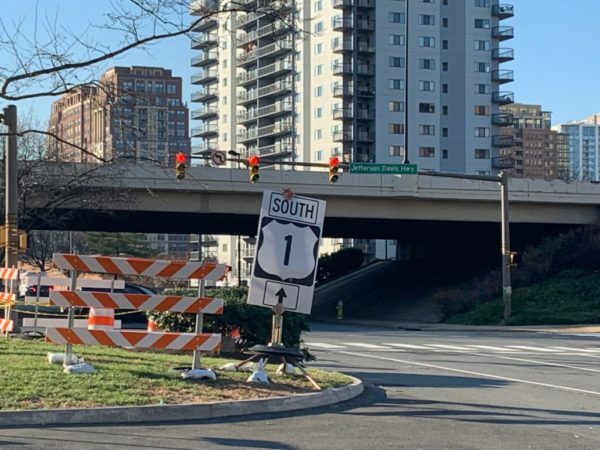 Google Maps has already unilaterally renamed the main thoroughfare “Richmond Highway” in Arlington, though it’s unclear if that was a mapping error or a deliberate decision on Google’s part.